The Vepr Submachine Gun doesn’t excel in any area but also isn’t bad at any range. It is an average Submachine Gun in all aspects. This means it is very versatile and doesn’t require any particular attachments. The Submachine Gun class mobility lets you be aggressive. Strafe to avoid enemy fire and keep moving around the map. Being aggressive is key with the Vepr Submachine gun. Take advantage of the high mobility by strafing enemies in close quarter combat whilst aiming down the sights. If you are very close be sure to fire from the hip. With the Vepr focus on medium range. At close range shotguns and other Submachine guns are better, but at medium range you can still get an advantage with the high mobility over assault rifles. At long range the damage of the Vepr is so low that you are unlikely to win engagements. The default Vepr doesn’t stand out in any particular way which means you have a lot of freedom when you choose attachments. The attachments I like are those that make the Vepr stand out in some way. The Silencer lets you stay off the radar which will confuse enemies and make it harder for them to spot your firing position. The Foregrip will generally make the Vepr better by reducing the recoil. Select perks that let you take advantage of the high mobility of the Submachine guns. Ready Up brings up your weapon faster after sprinting allowing you be more aggressive. Sleight of Hand ensures that running out of ammunition isn’t a great problem and, in combination with On the Go, makes reloading the least of your problems. At close range firing from the hip is important to win gunfights. Steady Aim increases your hip fire accuracy. Because you need to be aggressive with the Vepr ICU will stop you from having to pause to regain health since you regenerate it faster. In summary the Vepr is an average Submachine gun. Which attachments you choose isn’t that important, but the silencer and Foregrip as well as the selected perks will make the Vepr stand out in close quarters and the medium range. 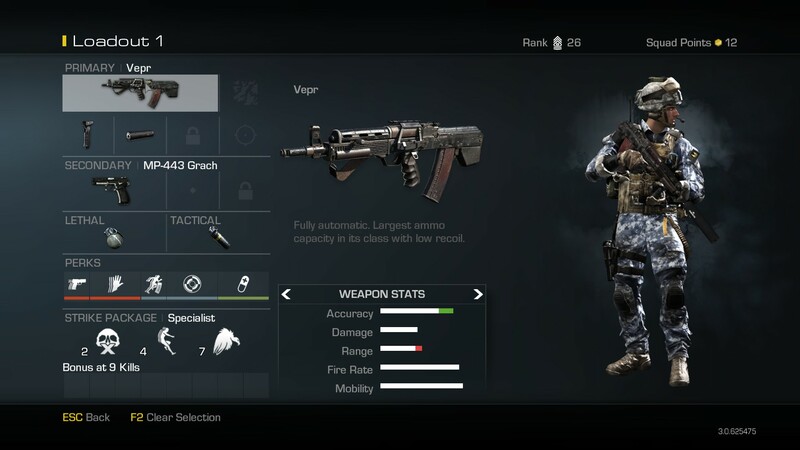 This entry was posted in CoD Ghosts Weapon Guide, Submachine Guns and tagged auluftwaffles, best Class Setup, Best Soldier Setup, Call of Duty, Call of Duty Ghosts, Call of Duty Ghosts Weapon Guide, Call of Duty Weapon Guide, Class Setup, Games, gaming, Ghosts, Ghosts Weapon Guide, guide, PC, Ps3, PS4, Soldier Setup, Vepr, Vepr Best Class Setup, Vepr Best Soldier Setup, Vepr Weapon Guide, video game guides, Video Games, XBOX 360, XBOX ONE. Bookmark the permalink.